Our Clubhouse is the gathering place of Fairway Manor Redisents. You will find a Banquet Hall, Fitness Center, Laundry Center, Community Room, Mailboxes, and the Management Office located in the Clubhouse. The Clubhouse was designed for the residents, a place to get together as a community and enjoy such activities as Bingo, Movie Night, Holiday themed gatherings, just to name a few, which all take place in the Clubhouse. Check out the Information Boards for upcoming activities on site and off and join in on the fun! 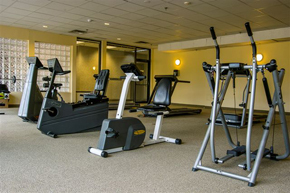 Get your daily workout in our Fitness Center located on the lower level of the Clubhouse. We have a flat screen TV and an assortment of fitness equipment including treadmills and bikes to keep you motivated and in shape. Hop onboard our private Jitney bus service to local supermarket shopping! Our Jitney departs Tuesday's and Thursday's for grocery shopping and the first Wednesday of the month our Jitney travels to the Gateway Shopping Center. 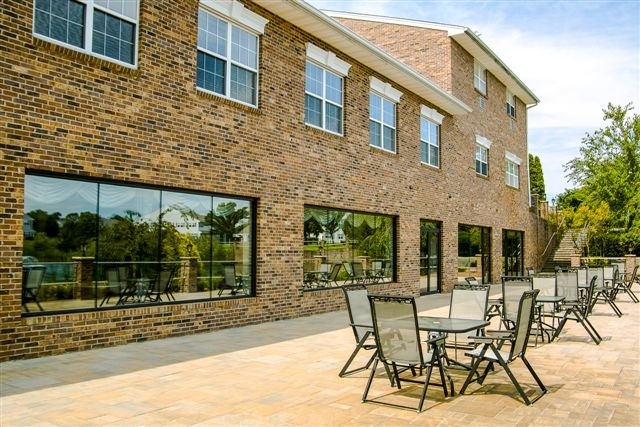 Enjoy our Lakeside patio complete with tables and chairs and barbeque grills for our resident’s use. 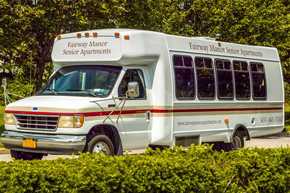 Fairway Manor has on site Management located in the Clubhouse and 24hour emergency service for evenings and weekends.